A team of researchers at the U.S. Department of Energy’s (DOE’s) Argonne National Laboratory have been involved in a comprehensive study of the reflectivity effects of transforming land to grow biofuel crops. Their study forms a portion of a complete analysis of greenhouse gas emissions from land use change: instances where land that was formerly grasslands, forests, or pastureland is converted to growing biofuel crops. In the past, these types of analyses took into consideration only alterations in the quantity of carbon stored in the vegetation and soil of these lands. The latest analysis, published in The Royal Chemistry Society's Energy & Environmental Science, includes the additional effect of alterations in reflectivity, or “albedo.” Albedo effects define the quantity of incoming solar energy that gets reflected back into space; these changes, together with several other factors, in turn contribute to alterations in greenhouse gas emissions. Although there is a lot of data variability, the findings indicate that when a piece of land is modified to grow a biofuel crop, there are changes also in the albedo effects. When just the albedo change effects are measured, the researchers discovered that land converted to growing corn ethanol caused a net cooling effect on climate. In contrast, land that was converted to growing switchgrass and miscanthus, two other plant sources for advanced biofuels, caused a net warming effect. But when carbon stock changes, another major effect of land use change, are also taken into consideration, switchgrass ethanol and corn display net warming effects linked with land use change whereas miscanthus grass ethanol displays a net cooling effect. The research led by researchers in Argonne’s Energy Systems and Environmental Sciences Divisions, outlines the significance of taking into account changes in reflectivity when evaluating land use change-induced effects of biofuel production on climate. Our analysis is helping build a fuller picture of the climate effects of biofuel feedstock production. Hao Cai, Argonne environmental analyst and lead author of the study. Cai and his team started their study by initially gathering data on land cover and albedo collected from the U.S. Department of Agriculture and NASA satellites, respectively. They mapped the albedo data linked with particular land types—for instance, prairie or corn cropland. Then they used simulations where they converted various land types to grow miscanthus, corn, and switchgrass, and observed how albedo and the net warming or cooling of the atmosphere would be affected consequently. Earlier researches of albedo effects of land use change studied only about 20 sites of specific land types. The current team of researchers analyzed millions of sites in over a thousand counties in the U.S., spanning 70% of the country’s corn production fields. Another factor that sets this study apart is the specific modeling approach used to simulate albedo effect on a finer scale and provide more robust data analysis. The model allowed Feng and fellow researchers to scrutinize the albedo dynamics of millions of parcels of land independently in squares just 500 m at a side (5382 ft). By studying a huge number of sites comprehensively, the researchers were able to consider site-specific variations to better characterize albedo effects in their analysis. Albedo effects differed among miscanthus, corn, and switchgrass crops partially because of differences in their shape and size, as well as growth and environmental factors—all of which can differ considerably from one site to the next. Albedo also differed greatly based on the type of land that was transformed. For instance, forest had the least albedo compared to other land covers, like grassland and shrubland, found in the same agro-ecological zone. The magnitude of the area of land converted, as fixed by economic modeling, also varied. For instance, when the researchers compared switchgrass and miscanthus production essential to produce a given biofuel volume, they discovered that converting land to miscanthus had a lower warming albedo effect in comparison to switchgrass. One reason for this is the fact that miscanthus needs lesser land than switchgrass to produce an equal volume of ethanol because miscanthus offers higher yields. 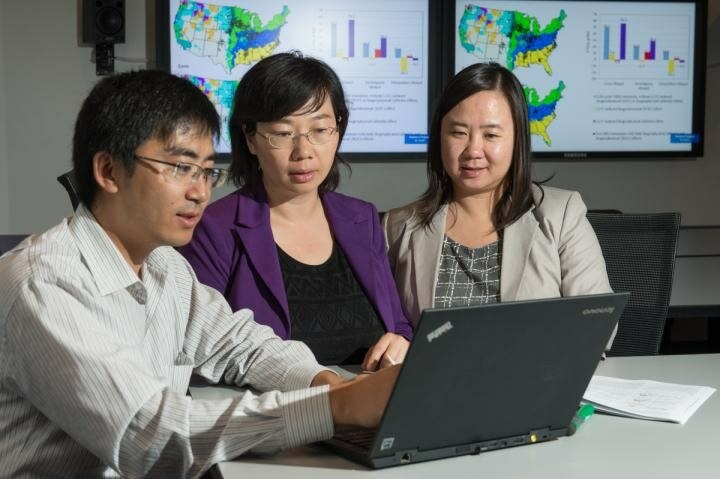 The computing resources at the Argonne Leadership Computing Facility (ALCF), a DOE Office of Science User Facility, were used by the researchers to process and visualize the albedo and land cover data. ALCF’s high-performance computing resources were critical to our analysis based on the amount of data we were working with. The facility provides powerful and helpful tools for data-intensive analyses like this. The study, “Consideration of land use change-induced surface albedo effects in life-cycle analysis of biofuels,” was supported by the DOE’s Office of Energy Efficiency and Renewable Energy.